Ventura Police officers and K-9’s brought smiles to the young children. 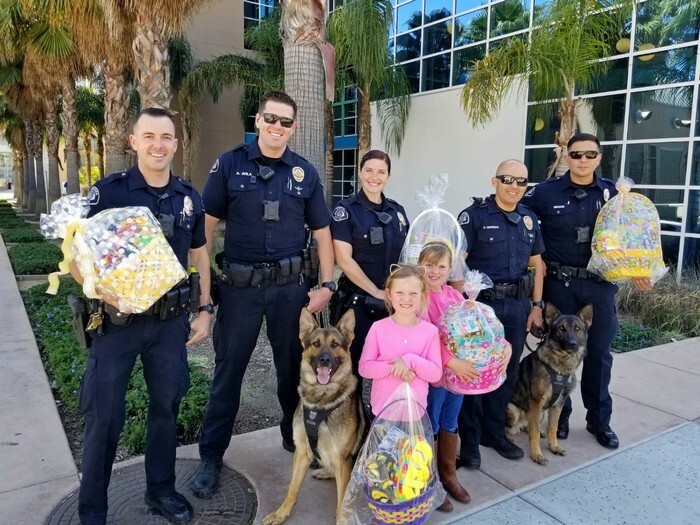 The Ventura Police Department partnered with the Teddy Bear Cancer Foundation and community members for an Easter Basket Drive for children battling cancer. More than 150 baskets were donated! Baskets were delivered to children and their siblings at the Ventura County Medical Center and also delivered to the homes of very sick children in Ventura. The Ventura Police Department collects toys throughout the year to keep the toy box filled for children being treated at the Ventura County Medical Center. 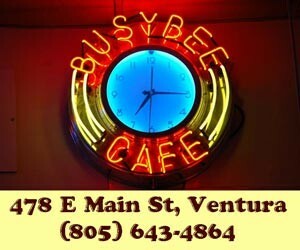 Community members can call Ashley Bautista at 805-339-4317 or email abautista@venturapd.org for more information. The key to creating a lasting and viable solution to protect the Ventura River watershed is collaboration between all its diverse water users. We all understand the obstacles facing the watershed, and we’re all at the table and ready to roll up our sleeves to establish a plan that secures our water supply. To that end, the parties to the litigation initiated by Santa Barbara Channelkeeper against the City of Ventura and the State Water Resources Control Board have started the settlement process by agreeing to a mediation meeting beginning in April where we will exchange ideas, raise tough questions and work together to find common ground. Many of the region’s diverse water users are in agreement that a locally-driven, physical solution achieved through a collective process is the ideal path forward. The City’s objective, during this mediation and beyond, is to establish an adaptive and lasting framework that clearly recognizes the needs and rights of each water user, makes the most of the watershed’s resources and shares the responsibility of preserving finite water supplies amongst all users. The City’s desired outcome will not have any “winners” or “losers,” but rather a shared commitment by all to protect the watershed. Collaboration is vital to this effort because, as you may know, the City of Ventura is just one of more than 100 users that pump and divert water from the watershed. Mediation provides the opportunity to create a proactive resolution that provides procedures and protections to ensure all of the parties are part of the decision-making. The court process also provides a standardized process for all parties to provide the information necessary to assess everyone’s future water use and needs. That’s why it’s the most efficient and effective approach to preserving our water supply. The varied interests in the watershed and the current lack of collaboration and accountability have made it difficult to assess availability in our water system and effectively manage our limited water resources for the future. We are eager to leave these challenges in the past and charge forward with a strategy that considers all of the watershed’s users and looks at the entire interconnected water system holistically. The dialogue that will establish this framework for the future has already begun. Solving the obstacles facing our region’s water resources – including the impacts of climate change, prolonged periods of drought and increased users – will take an investment of time and work, but I’m confident we can address them through a collective effort. The next steps of this effort includes the first mediation next month, further, regular mediation sessions between all of the watershed’s parties, careful analysis, technical and legal research to inform all of our proposed solutions and, ultimately, a fair and lasting settlement approved by the court to protect the Ventura River watershed. The City remains committed to positive momentum and ensuring that these critical challenges are resolved in a fair and proactive method that safeguards our water supplies now and moving forward. 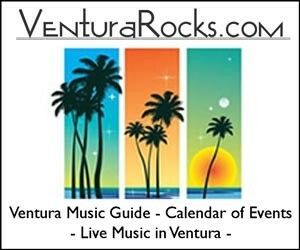 During a regularly scheduled meeting of the Ventura City Council recommendations and voting, along with special presentations and announcements were conducted including the Mayor for a Moment program enabling students from local schools to sit in the Mayor’s chair and present an essay to the council and public. This month Joey Baccerra from Junipero Serra Elementary School was honored as Mayor of the Moment by the City Council. Joey took the Mayor’s seat and read an essay he penned. An avid sportsman Joey was lauded by teachers and administrators for his excellent academic achievements and his sportsmanlike attitude in everything he has accomplished. Another special presentation followed A Census Presentation “The Road to the 2020 Census” given by Jesse Gonzalez, Partnership Specialist, U.S. Census Bureau, Los Angeles Regional Census Center. He discussed the importance of the census in the allocation of Federal funding for cities and how important the results will be for the City of Ventura. Designate the City Manager to act as the agent for the city to sign all related documents and subsequent amendments thereto to implement this agreement. Authorize Finance and Technology to appropriate funds to the proper projects, accounts, and funds for reimbursement of expenses incurred by the city as a result of this lease agreement. Item 8I: Sewer line Replacement – Seaside Wastewater Force Main- Authorization to Execute Professional services Agreement with Padre Associates, Ic. 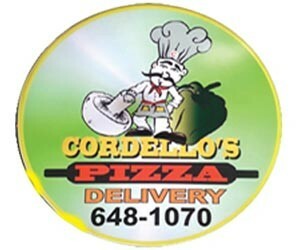 For Environmental Consulting Services. 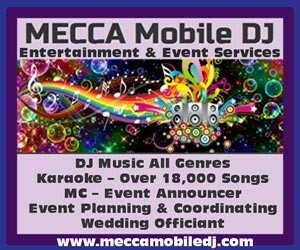 Amend the insurance requirements for special events based on the three-tiered structure and eliminate the requirement for vendor insurance for most Special Events. Authorize the City Manager to execute a Funding and Services Agreement not to exceed $250,000. Passed by council with one opposing vote by Councilman Jim Friedman. Ventura Water announced the 2019 honorees at the 7th Annual Water: Take 1 Film Festival, a free community event held March 21 at the Buenaventura Banquet Center, in celebration of World Water Day. Ventura High School’s environmental club and Surfrider Foundation’s Ocean Friendly Garden program were presented with the Community Partnership Award. Local environmental advocates, Ron and Barbara Barrett received the Community Member Award, and CLEAN International was awarded the National Organization Award. All honorees received a $500 award for their inspirational conservation efforts and commitment to elevating the value of water. City of Ventura Mayor Matt LaVere kicked-off the film screenings of water-themed short films profiling each honoree’s inspiring story. The films can be viewed at www.watertake1.com. The Water: Take 1 Film Festival, recognizes individuals, non-profits and organizations with exemplary efforts in water conservation, resource management, and sustainability by producing short films in honor of their commitment to making a difference. The event is proudly sponsored by Carollo Engineers, Nossaman LLP, Hopkins Groundwater Consultants, and Kennedy Jenks Consultants. “This year’s honorees exemplify the critical efforts of community members that inspire change through forward thinking water conscious actions and initiatives,” said Ventura Water Interim General Manager Susan Rungren. Event sponsors Hopkins Groundwater Consultants, and Kennedy Jenks Consultants recognized Surfrider Foundation’s Ocean Friendly Garden program for partnering with Ventura High School students to replace over 1,000 square feet of lawn with a new water wise garden. The new landscape was designed to save water, prevent stormwater pollution, and serve as a demonstration garden for the public. Representatives from Nossaman LLP presented the Community Organization Award to Ron and Barbara Barrett for their leadership in protecting local watersheds and inspiring youth to care for the environment. For more than 30 years, the couple has volunteered as site leaders for the Ormond Beach annual Coastal Cleanup Day. CLEAN International, whose mission is the eradication of waterborne illness and an end to the daily walk for water worldwide, was presented the National Foundation Award by Carollo Engineers. The Ventura-based non-profit organization advocates for clean, sustainable, and convenient water and sanitation around the world. On February 19, the City of Ventura held an awards ceremony at City Hall to recognize fifteen employees nominated for the 2018 Employee and Supervisor of the Year. These awards recognize city employees who are role models for public service and exemplify the city’s commitment to excellence. Cheryl Bucklin, Recreation and Community Partnerships Coordinator, was selected as the 2018 Employee of the Year. `John Willis, Wastewater Plant Supervisor, was selected as the 2018 Supervisor of the Year. 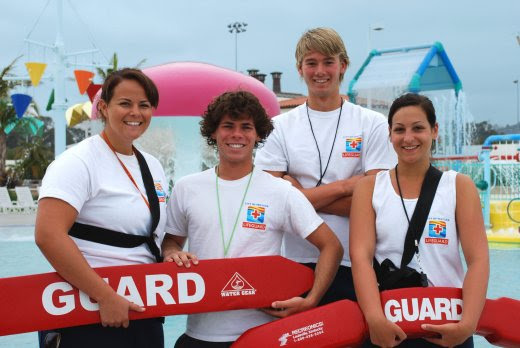 If you would like to serve as a Ventura Aquatic Center Lifeguard, now is your chance! 1. No need to decide what to wear to work. Your wardrobe is a bathing suit with a uniform shirt and shorts. 2. Killer workout every day- swim between your shifts. 3. 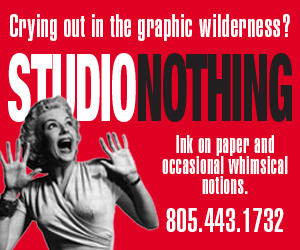 Work outdoors in Ventura. Yes, please! 4. Co-workers, you may not know any of them when you start, but by the end of it all, they will be your best friends. 5. Ability to save a life…mic dropped! If you are over the age of 16 and would like to serve as a Ventura Aquatic Center Lifeguard, now is your chance! 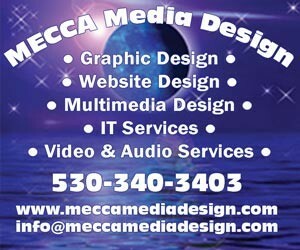 No certifications are necessary to try out, just a good attitude and strong swimming skills. Several tryout dates are available. Show up to the tryout that is most convenient for you, no need to RSVP. No additional tryout dates will be added. 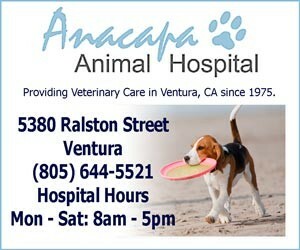 For further questions, please contact the Ventura Aquatic Center at 805-654-7511. 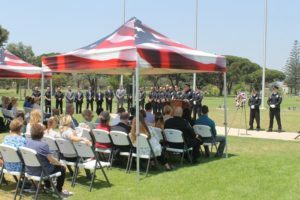 On August 7, 2018 a ceremony was held at Ivy Lawn in honor of Sergeant Dowell’s life. 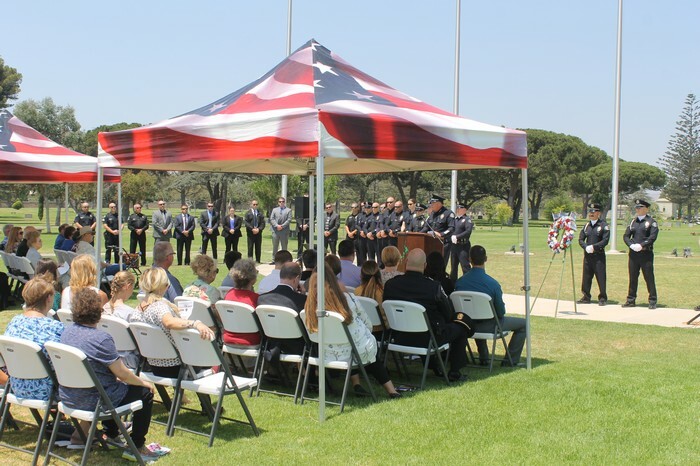 The Ventura Police Officers’ Association (VPOA) is accepting applications for the 16th annual Dee Dowell Memorial Scholarship. The scholarships will be presented in to honor Sergeant Darlon “Dee” Dowell, who was shot and killed on August 7, 1978. Sergeant Dowell is the only officer in Ventura’s history to die in the line of duty. At the time of his death, Sergeant Dowell, 32, was a nine-year veteran of the Ventura Police Department. He is remembered as a dedicated police officer, devoted husband, and loving father to his two young children.The City of San Buenaventura named Dowell Drive, the location of police headquarters, in Sergeant Dowell’s honor in 1979. In selecting scholarship recipients, the VPOA will consider academic achievement, school and community service, and financial needs. Applications must contain all required information and be returned no later than April 12, 2019. Incomplete applications will not be considered. 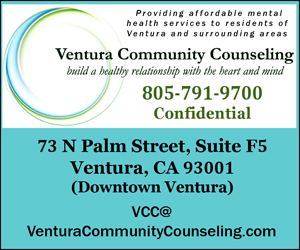 Ventura resident or have graduated from a high school in Ventura within the past three years, or a Ventura Police Department employee or employee’s child. Submit a letter of recommendation from a public servant. For additional information please contact Ofc. 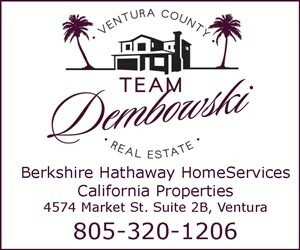 Mike Hibdon at 805-339-4443 or mhibdon@venturapd.org. 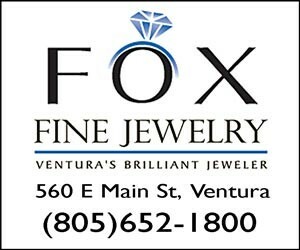 Applications are available at the front desk of the Ventura Police Department on Dowell Dr. The City of Ventura invites community members and stakeholders interested in learning about the VenturaWaterPure project’s role in a sustainable water future for Ventura to review and comment on the Ventura Water Supply Projects Draft Environmental Impact Report (Draft EIR). The public review and written comment period for the Draft EIR will run until April 19, 2019. The City of Ventura is currently in the planning phases for the proposed VenturaWaterPure Project which includes the construction of an Advanced Water Purification Facility (AWPF) for potable reuse. Potable reuse is the proven use of recycled water to supplement drinking water supplies. After years of special studies, environmental assessment, demonstration facility testing, and stakeholder meetings, the City determined the best way to enhance environmental protection while improving local water quality and supply reliability is to divert highly treated wastewater discharges for reuse. The final product of this state-of-the-art AWPF would be a new, locally owned source of highly purified drinking water that provides Ventura with a long-term drought resilient water supply solution. Interested persons, organizations, and agencies are invited to attend a public meeting, in conjunction with the regularly scheduled Water Commission meeting, to receive an overview and ask questions about the environmental analysis of the project. Written comments on the Draft EIR are due no later than 5 PM on Monday, April 19, 2019. Upon completion of the environmental review process, the next steps include permitting, final design, and bidding for construction. For information on how to review the Draft EIR and submit written comments, visit www.venturawater.net and click on the Ventura Water Supply Projects graphic. Friends, councilmembers and city staff joined Jim to celebrate his new street. 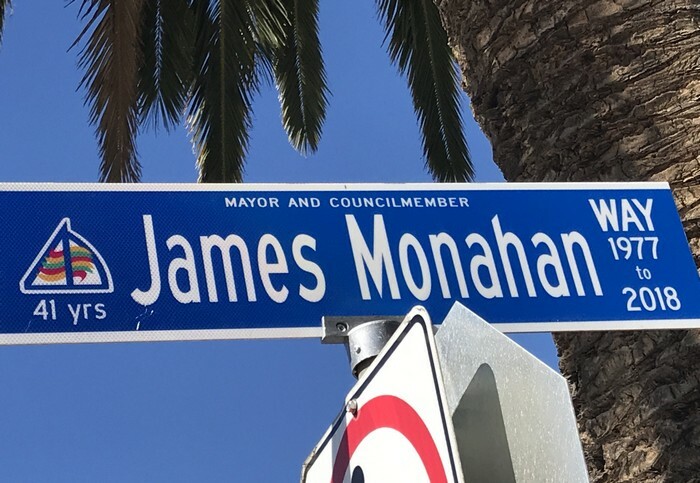 Former Ventura Mayor and City Councilman Jim Monahan may no longer serve on the City Council, but his legacy will now live on forever. 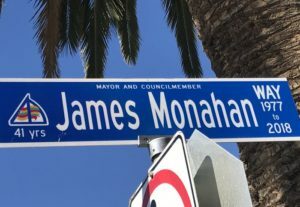 A newly named street, James Monahan Way is at Poli Street and the City Hall parking lot as well as the gateway to the Ventura Botanical Gardens. 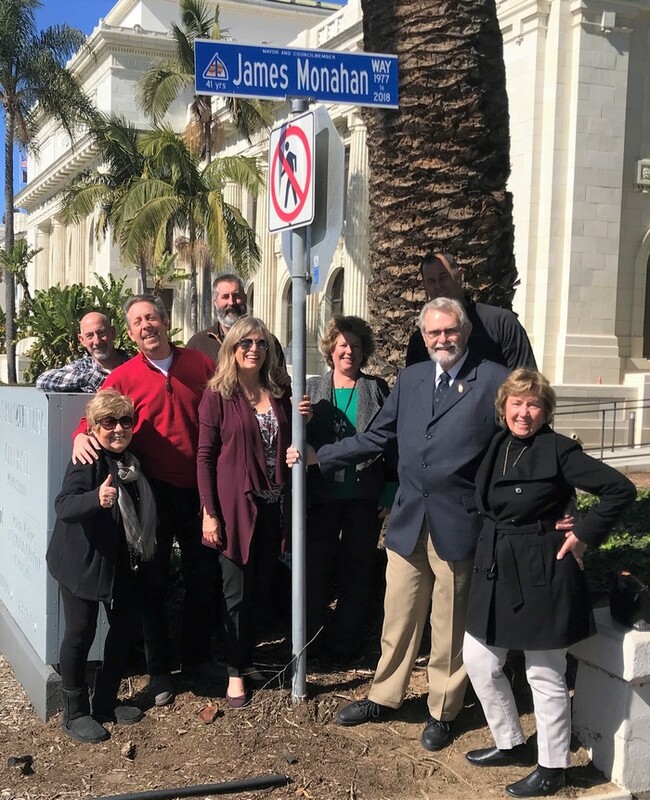 Monahan was honored with this street designation at his retirement council meeting in December. In his unprecedented run, Monahan served on the City Council from 1977 to 2018. He stepped down in December, having chosen to not seek reelection. The street designation caps a year of honors for Monahan, who also recently accepted the 2018 Citizen of the Year Award from the Ventura Chamber of Commerce. Among the countless ways that Monahan has touched the community is in his enthusiastic leadership and as founder of the St. Patrick’s Day Parade. American flags fly everywhere on patriotic holidays because of his work to organize volunteers to hang them. He’s also known citywide for his work advocating for the people of Ventura Avenue, where his father started American Welding in 1928 and where he still maintains an office. An early advocate for a Veterans Home in Ventura County, Monahan got to see that happen, and he continues to serve on the Gold Coast Veterans Home Foundation. He has retired from elected office but certainly not from community service.